Exploring Sylvia’s publications through animating the image with air and sunlight. Sylvia Pankhurst published a number of books and I have explored their content and explored the physical presence of the book object through animation. Additionally, I have explored Richard Pankhurst’s book using similar technique and setting. 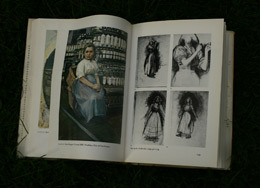 It was through reading Richard’s book on Sylvia’s artwork that I was drawn to showing this book object as a thing in itself and as I had interviewed Richard sitting outdoors in a carved Ethiopian chair, framed centrally like the cotton worker in Sylvia’s picture I felt that it would be worthwhile to shoot the books outdoors. The play of wind and light on the paper and the detail of the ink and paper and encouraged me to animate some of the pages by way of showing the substance of the book and giving a condensed experience of Sylvia’s artwork. 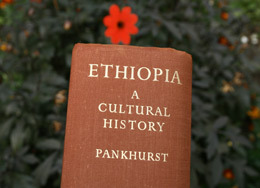 Ethiopia, A cultural History by Estelle Sylvia Pankhurst. Published 1955, Fletcher and Son Ltd, and dedicated to The Emperor Haile Sellassie 1, Guardian of Education, Pioneer of Progress, Leader and Defender of his People in Peace and War.